Each in their own right have reigned upon our hearts and lives for decades. They represent the two quintessential living icons that all Iranian girls have aspired to for generations and Iranian boys have dreamed of as mother, wife, or mistress (*) : Googoosh the Pop Star of pre-revolution Iran, the symbol of emancipation of the Iranian Women under the Pahlavi Rule and whose tremendous voice and charisma propelled her into the limelight of success and popularity never equaled by any other Iranian female celebrity. Shahbanou Farah Pahlavi was the shy Paris Art Student whose Cinderella like destiny was to become the very first Crowned Queen of the 2500 years old Persian Monarchy. Both Giants have lived up to their public image despite highs and lows of life and destiny. The Queen of Iran was the most respected and widely photographed women of the 20th Century. Host to the Persepolis Celebrations of October 1971 and happily married to one the mightiest rulers of the World, her role was not just symbolic. She was deeply involved in social and cultural activities and missions throughout her reign and was to become the muse of Western Artists worldwide. (**) Googoosh’s talents were to be noticed beyond Iranian frontiers by the end of the 70’s and she was awarded in <?xml:namespace prefix = st1 ns = "urn:schemas-microsoft-com:office:smarttags" />France and Germany with several prestigious Awards in Music. But the dark days that followed the Islamic revolution was to be determinant in turning both living icons into Legends for the majority of Iranians beyond political and social preferences. The exiled Queen was to keep her head high and become a true ambassador for the ever growing Silent Majority of Iranians both in exile or in Iran. Her dignity and kindness have earned her the respect of her compatriots over the years. 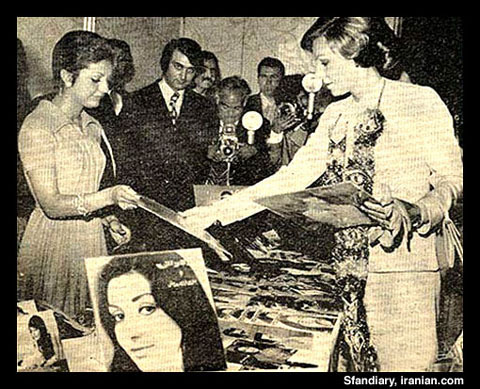 As for Googoosh, she was to equally resist in silence for 20 years after making a miraculous comeback in the year 2000 thanks to the more open policies of the Iranian government under former President Khatami, which allowed the Persian Diva to leave the country and undertake one of the most remarkable 2nd career for an artist forced to silence for more than two decades. As for all people in the public eye be it celebrities or Royals, Googoosh and the Shahbanou’s lives have always been under scrutiny by the press. Unconfirmed rumors of all sorts were circulating over the years as to why Googoosh and the Empress were not seen together in public since the Diva’s return from Iran. Some claimed that Googoosh had been approached by various political groups who tried in vain to lure her into political activism. Others claimed that Googoosh was at odds with the Royal family because of alleged sexual assaults on her before the revolution by members of the Pahlavi family or that the SAVAK, the Shah’s secret police, had intimidated her during their reign. Googoosh was also falsely accused by former fans to have supported the Revolution and Ayatollah Khomeini rise to power by singing the song “Agha Khoubeh” a song which was actually written many years prior to the Revolution. In an interview given to Singer Mehrdad on an LA based Iranian TV channel, Googoosh actually denied to have ever had any political intentions in singing this song but that it was released just during the events and in the confused days of the revolution. None of these ridiculous rumors were ever confirmed but the question as to when and where the two Public Icons would meet remained a public curiosity. The tragic death of Princess Leila the youngest daughter of the Empress which was followed by the unexpected terrorist attacks of September 11Th, and the visa restrictions imposed on all Iranian expats in the aftermath of this attack could explain why this encounter did not take place earlier. The Shahbanou and Googoosh were equally subject to these restrictions due to the simple fact that neither had an American Passport. 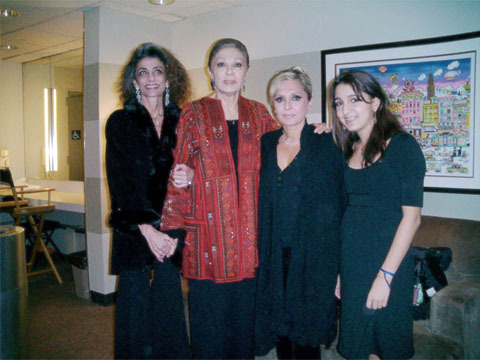 One or two of Googoosh’s concerts in the US were simply canceled as for the Empress, whose children and grandchildren reside in the US, she was also subject to humiliating visa controls at both American and Canadian Airports by security officers who simply would ignore her rank and identity as former Empress of Iran. It was finally thanks to a common contact that the Empress’ office and that of Googoosh were to be put into contact with one another, and that the decision to organize the much expected meeting was to be taken. 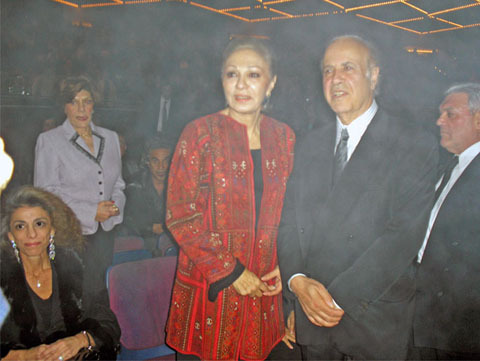 The thousands of fans, packed at the Legendary Madison Square Garden Concert Hall on the evening of Oct. 21st 2006 could hardly believe their eyes when seeing Googoosh and Mehrdad announce the arrival and presence of the Pahlavi Family : The Shahbanou, her daughter Princess Farahnaz and her second granddaughter Princess Iman ( for whom it was certainly the very first public appearance before a huge crowd of compatriots). The Crowd greeted the Royals with deep enthusiasm, cheers and claps as the Shahbanou responded with a bow of acknowledgment to her compatriots. After the concert the Royal Family was also warmly greeted by fans in the crowd who kissed them affectionately and asked for autographs. who organized the meeting between the Royal Family and Googoosh. 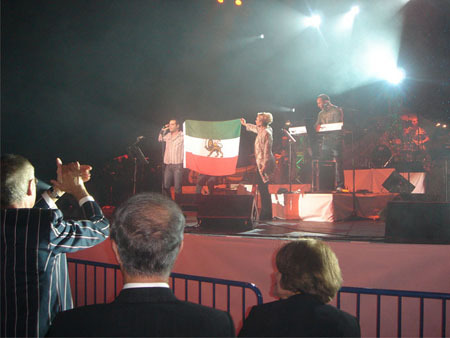 Towards the end of the Concert Googoosh and Mehrdad put up the Iranian Flag with Sun and Lion and were cheered by a standing ovation. The meeting between the two giants and their close friends and family would finally take place in the Star’s Lounge and was a very emotional and nostalgic meeting for all people present. The Persian Diva and the Shahbanou hugged one another warmly and posed for the photographers. Nearly 30 years had separated their last meeting. 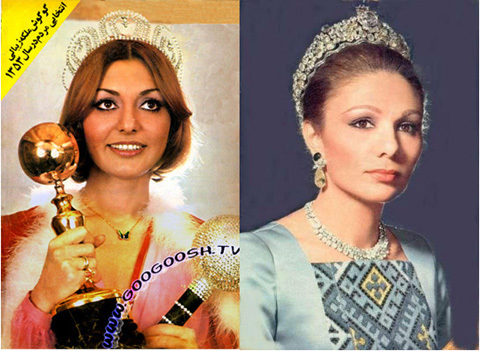 Googoosh had performed many times for the Royal Family and was a favorite of the Pahlavi children. And they were to recall the party given for the Crown Prince’s Birthday in 1977 during which Googoosh was to sing a memorable “Tavalodat Mobarak” aka Happy Birthday tune to everyone’s enthusiasm. including a young Crown Prince Reza Pahlavi shaking his head to the beat (1977). It was high time for the third generation of the family to be presented to Googoosh in the person of an enthusiastic and fast growing Princess Iman. The Press was conveyed to retire and the Diva and Royal Family were to spend time together in Private. Recommended Viewing : Googoosh sings (video clip here) at a private party attended by the royal family, including a young Crown Prince Reza Pahlavi shaking his head to the beat (1977). Recommended Reading : Alain Delon’s Tribute to the Shahbanou Paris Alzheimer Gala 2005. About the Author: Darius KADIVAR is a Freelance Journalist, Film Historian and Columnist of the OCPC Magazine USA. He operated as Paris based Head of PR & Press for WAALM® 2nd annual Awards 2006.